Orson Scott Card’s Hugo and Nebula award-winning novel about Andrew “Ender” Wiggin is one of those rare cross-over threats of speculative fiction. Much like The Hobbit on the fantasy side of things, Ender’s Game is the one sci-fi book most likely to have been read—and loved—by that friend or family member who usually eschews science fiction. A perennial presence on the reading lists of high schools and military academies alike, Card’s 1985 novel is also one of those “one-sitting reads”—not until Harry Potter and Katnis Everdeen would a character’s struggles so destroy sleep schedules and next-day job performance. But it’s also a challenging novel to adapt. Card himself has called Ender’s Game unfilmable, since “everything takes place in Ender’s head.” Director Gavin Hood’s latest film both proves and disproves that notion. His Ender’s Game captures much of the plot, and misses much of the magic, of its source material, substituting a fairly robust level of spectacle and Grade A acting (with, albeit, a Grade C script) for the more complete, character-driven immersion of the source material. Ender’s Game takes place decades after first contact with an alien species (the Formics) had almost proved an extinction event for the human race. Determined to prevent another such encounter, Earth’s leadership has adopted a “the best defense is a good offense” approach, recruiting talented children into “battleschool” for eventual use in a final confrontation with the Formics. Ender Wiggin (Asa Butterfield) is one such child. Col. Hyrum Graff (Harrison Ford at his gruffiest) and Maj. Anderson (Viola Davis) spend much of their time watching him intently and delivering portentous comments to each other. Meanwhile, Ender is placed in a succession of tough situations meant to test his mettle, making friends—including Bean (Aramis Knight) and Petra (Hailee Steinfeld)—and enemies all the while. For obvious reasons, the casting of Ender was crucial. Get it wrong and none of the other challenges in filming the “unfilmable” matter. Butterfield (Hugo) proves a solid choice. Surrounded by one Oscar winner (Ben Kingsley) and a slew of nominees (Ford, Davis, Abigail Breslin), Butterfield holds his own—communicating as well as the script allows both Ender’s strength and conflicted frailty. But ultimately, the plot of Ender’s Game is on a schedule that doesn’t allow for much subtlety. More often than not, it substitutes pronouncement for performance when it comes to character development, and acting chops give way to a series of increasingly impressive CGI-enabled set pieces. 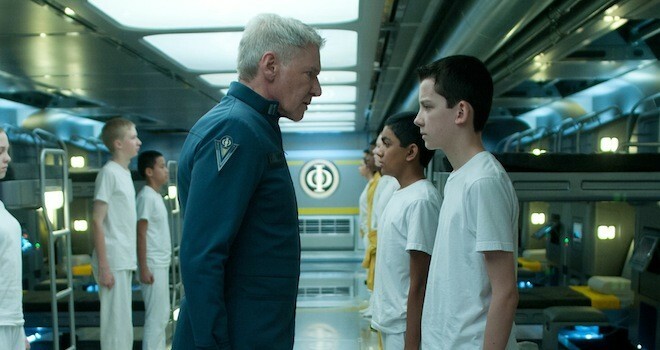 As a result, at 114 minutes, Ender’s Game still feels rushed. It’s enough to make one wish Hood had been able to channel enough Peter Jackson or James Cameron to gain an extra 45 minutes or so, studio fears be damned. But he didn’t, and this lack of screen time for Ender and his fellow characters—particularly his siblings, Valentine (Breslin) and Peter (Jimmy Pinchak)—saps the punch of Game when compared to its source material. On the printed page, the story of Ender Wiggin was one you lived. Up on the big screen, it’s just something you watch. Such a difference between source and adaptation isn’t that surprising—one could even argue it’s not a flaw at all. But for a film that will itself need to manifest some of the cross-over appeal of the book upon which it’s based, it may prove the difference between box office gold and just another much-hyped, would-be blockbuster that might have been.